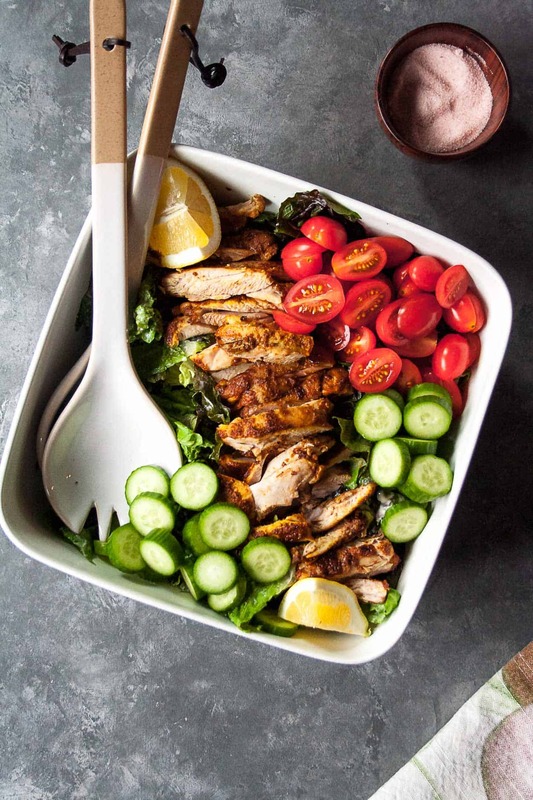 Made with simple, Whole30 approved ingredients, this chicken shawarma salad is a breeze to whip up and an easy way to bring some Mediterranean flavor into your kitchen! Alternative title: the only salad I ever want to eat, ever. Growing up, we didn’t eat a lot of Mediterranean food. And honestly I didn’t really eat much at all until a few years ago. There are tons of fast, fresh Mediterranean restaurants all over Chicago. And this type of food quickly became a go-to for me on nights when I didn’t want to cook/didn’t have time and still wanted to eat something healthy. Fast forward to this past December, Pat and I moved up to Andersonville. Andersonville is an incredible neighborhood on the north side of Chicago – filled with tons of restaurants, shops owned and run by residents of the neighborhood, and the feeling like you’re not quite in the city anymore. At the main intersection, there is the Middle East Bakery and Grocery – a phenomenal place to pick up the smoothest hummus of your life, olive tapenade that is better than any I’ve ever tasted, and every Middle Eastern/Mediterranean spice under the sun. AKA heaven. And that’s just the grocery store. If you head next door and order anything (literally anything) off the menu, you will leave happy. Last time I stopped in, I picked up their ‘chicken shawarma spice blend’ which is a mix of cardamom, coriander, cumin, cloves, black and cayenne pepper, fenugreek, ginger, allspice, paprika, and turmeric. And it was a great decision. If you don’t have access to this store or cannot find a chicken shawarma blend at your local spice store, I would suggest using the spices outlined in this recipe. I really like picking up blends like this from spice shops because it makes making dinner so much easier! And I like knowing that all of the spices are already put together in the appropriate proportions. 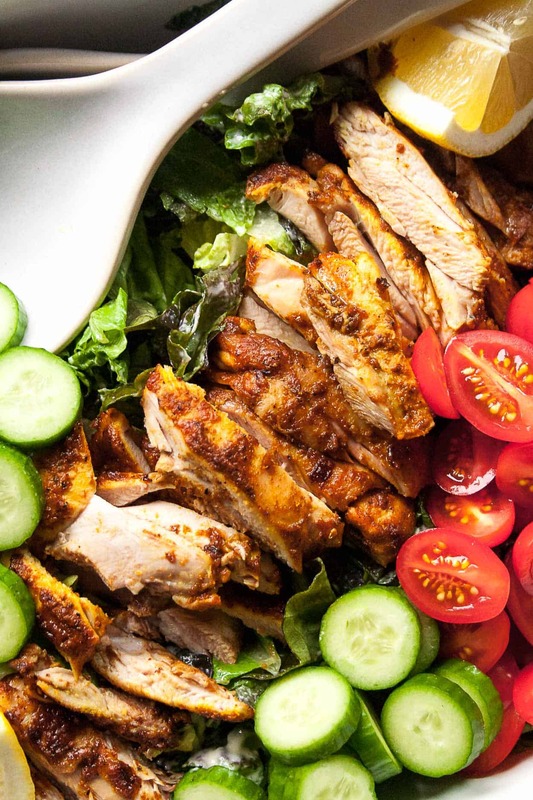 Once you have your spice blend, store bought or homemade, it’s time to make this chicken shawarma salad! 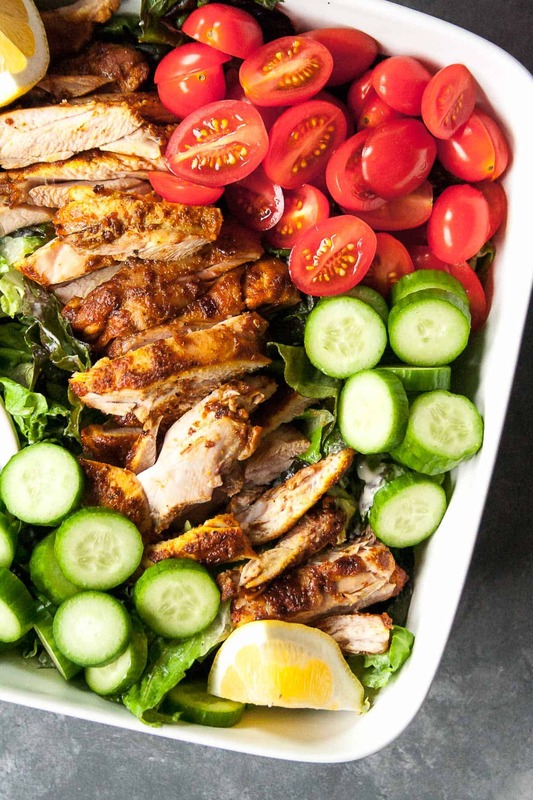 There are two key components that make this salad epic – the marinade and the dressing. For the marinade, combine your spice blend with lemon juice and avocado oil. If possible, marinate the chicken (use thighs!) for 4+ hours, but at a minimum of one hour. Let the chicken really hang out in the marinade as long as possible to soak up the flavor. And the dressing. Oh baby, this stuff is GOOD. The base, and what gives it the creamy texture, is another Mediterranean staple – tahini. Tahini is made from ground sesame seeds and is the texture of real nut butter, which is essentially what it is! These two together create such an array of flavors that is perfectly offset by the crisp veggies and greens. I just know you are going to love this! 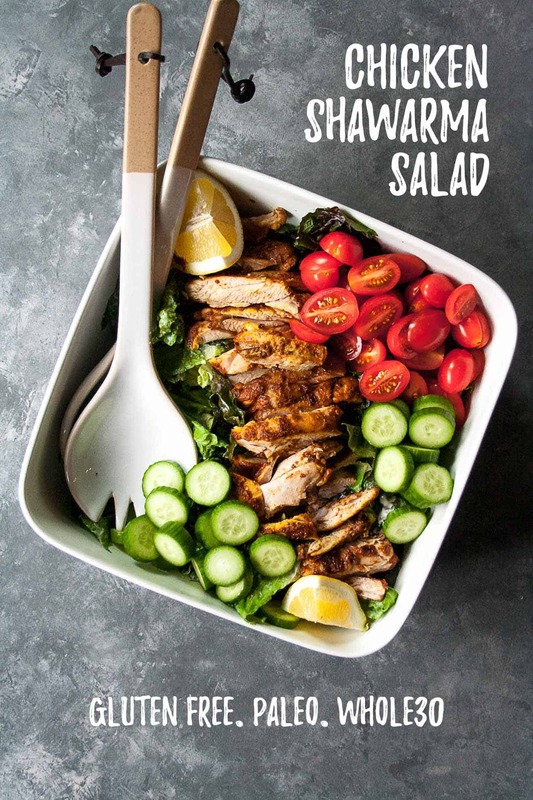 When you make this Chicken Shawarma Salad, post a picture on social media and use the hashtag #imhungrybynature for a chance to be featured! Combine all ingredients for the marinade in a small bowl and whisk together. Place chicken into a plastic bag and pour marinade over the top. Allow the chicken to marinade in the fridge for at least one hour. Preheat oven to 425 degrees F. Place chicken on a rimmed baking sheet and pour excess marinade over top. Roast for 30 minutes or until cooked through. While the chicken roasts, prep your salad and dressing. In a large serving bowl, combine all salad ingredients and toss. To a blender add tahini, olive oil, lemon juice, 1/4 cup water, salt and pepper. Blend until fully emulsified. If continue to add up to an additional 1/4 cup water until the dressing reaches your desired consistency. Toss the salad with the dressing (I didn’t use all of the dressing!). When the chicken is done, allow to rest for 5 minutes and slice into strips. 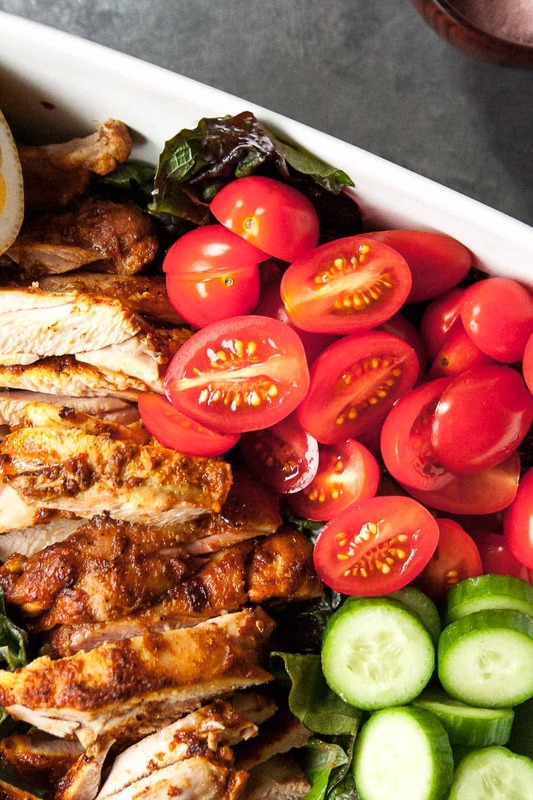 Add chicken to salad and serve immediately.